Vote for the winner of the 2008 Turbulence Training Transformation Contest Below! Only 1 Vote allowed per IP Address, so be sure before you click the vote button! 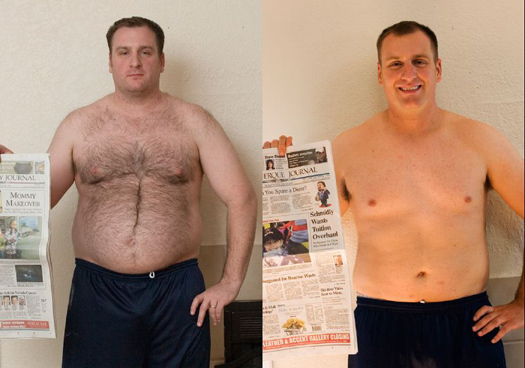 "Steve Hays Reverses the Aging Process...By Losing 33.4 Pounds of Fat and 7.5 Inches From His Gut in Just 12 Weeks"
12 weeks ago, I was nearly 34 pounds heavier. I was 271 pounds, the heaviest I’d ever been in my life. I felt fat. My XL clothes were tight, and I had just bought size 40 jeans (a first in my life). Despite all this, I didn’t do anything about it, until my 3 year old son asked me why I had “big boobies.” I can’t think of a more embarrassing question a son can ask his Dad. I found great support from Craig and the rest of the great people in the TTMembers.com forums. As I progressed further into my 12-week transformation, I found that my body was losing fat extremely quickly, but more importantly, my mindset was changing. I found myself looking forward to the workouts, and looking forward to eating good foods. I never worked out more than 3 days a week. In fact, I had overworked myself at the beginning, and worked out only once in the first 18 days of the contest, and it showed: I only lost 2 pounds. For the last 66 days, I really started following the Turbulence Training program to the letter, and ended up losing 32 pounds in that time. Weeks 1-3: Bodyweight 200. Once. This is the first time in my life I feel like I am in decent shape. Before the contest, I couldn’t do any chinups, now I can do almost 4. Before, I had trouble bench pressing 55lb dumbbells. Now, I use 75lb dumbbells. Finally, the bodyweight 200 circuit that I did as my first TT workout took me nearly 30 minutes to complete, and made me feel like I was about to die afterward. Today, I did the exact same workout in under 13 minutes, and felt ready to do another couple rounds. Turbulence Training works. I am proof of that. But I’m also proof that it only works if you put the principles into practice. Once I read the book, I intellectually knew how I could lose fat. Now that I’ve followed the program, I know how to lose fat.